Intentional Living Hawaii: Adventures in Water Kefir, part 4. I'm making Hooch. 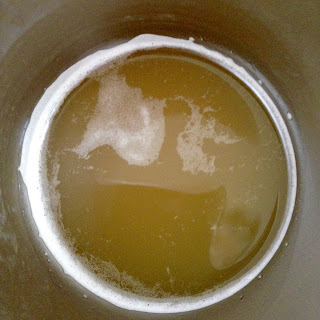 Adventures in Water Kefir, part 4. I'm making Hooch. In an effort to up the level of carbonation, I tried pushing the fermentation time from just over 24 hours up closer to 48. My experiment definitely upped the carbonation to a great level (like a soda pop), but as it turns out, water kefir and fruit juice can make a great carbonated alcohol. Not really what I was looking to do. All fermented products of this nature contain some alcohol. In fact, orange juice even contains a minor amount although you would have to drink gallons at once to feel it's effects. So I'm back to just a 24 hour (or so) fermentation and a clear head.